The last trip I took to Jack Rose Dining Saloon in DC yielded yet another interesting and nearly extinct scotch. It’s hard to pick out something to drink when you have 1500 bottles staring you in the face, but this night one jumped out. Bruichladdich put out a line some time ago called “Full Strength.” The labeling is what you think, bottled at a high ABV, this one was at 57.1 or 114 proof! I thought, for some reason, this would be an excellent dram to try. Well, what you wouldn’t guess, unless you’ve had it, is that this is the smoothest 100 plus proof whisky I think I’ve drunk in some time. Very light and floral, very nice. It was bottled in 1989 after 13 years of aging. 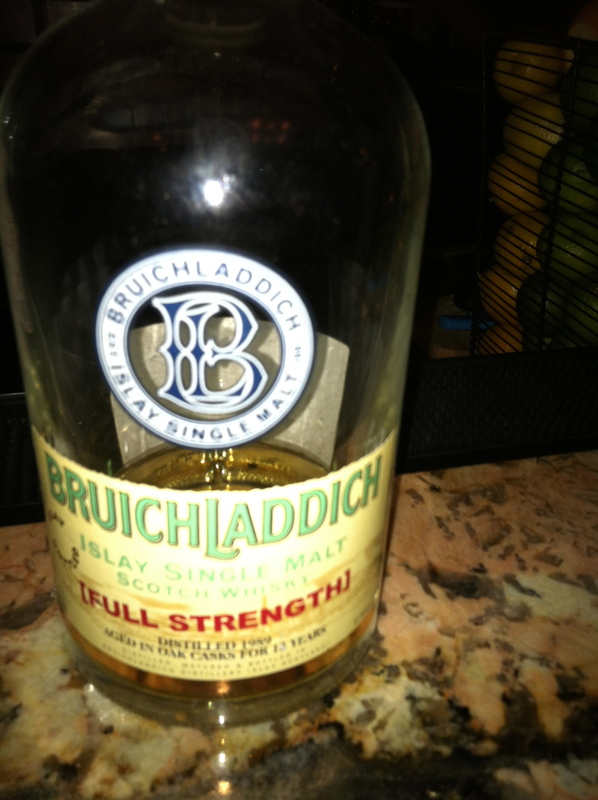 I’m really happy to say I have tried this Bruichladdich and if you happen upon this one do not hesitate to try it! I did, three times!